Menu Plan Monday is really helping me stay on track with meals and especially with keeping up with grocery shopping (my least favorite thing to do). I've been planning menus and making my shopping list on the weekend. I don't shop at the beginning of the week, so I plan the first part of the week using ingredients that I already have. Actually, this week my menu is mostly from ingredients that I already have on hand. 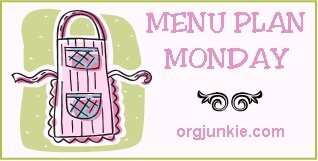 If you want to see other people's menus for this week or post your own, go to orgjunkie.com. Notes: Soak oats for tomorrow's "porridge"